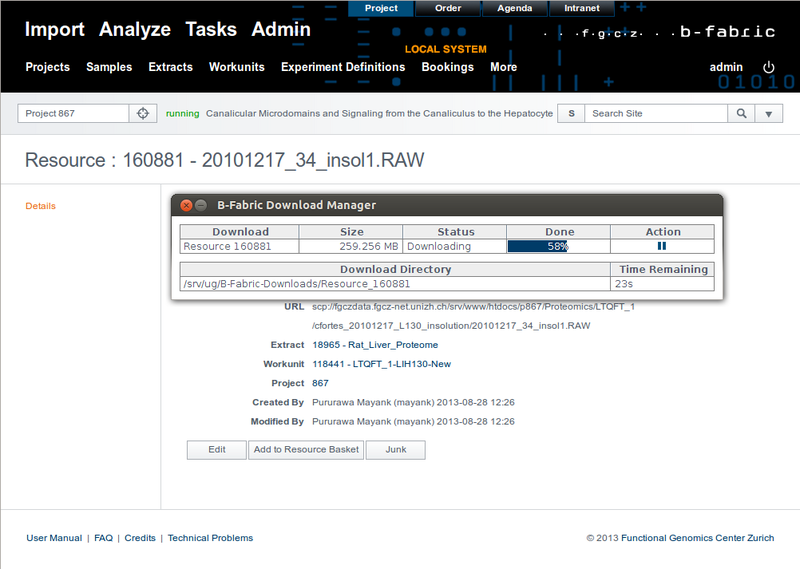 On the show resource screen as well as in many resource listings you can find the Download (via the B-Fabric Download Manager) button next to Resource status. When you click on the Download button, a warning message will be prompted by Java for security reasons unless you have checked the corresponding box. 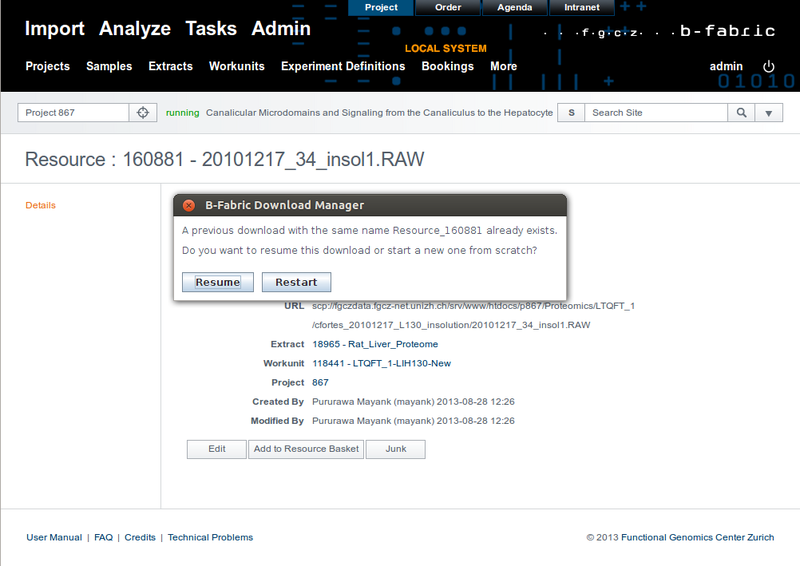 If you stop the current download, you might resume it via B-Fabric by clicking Download button again or you can directly execute ResumeDownload.jnlp file in your local download folder. If you have no Java installed on your local machine, e.g., due to missing admin rights, there is the (less reliable) HTTP Download alternative. 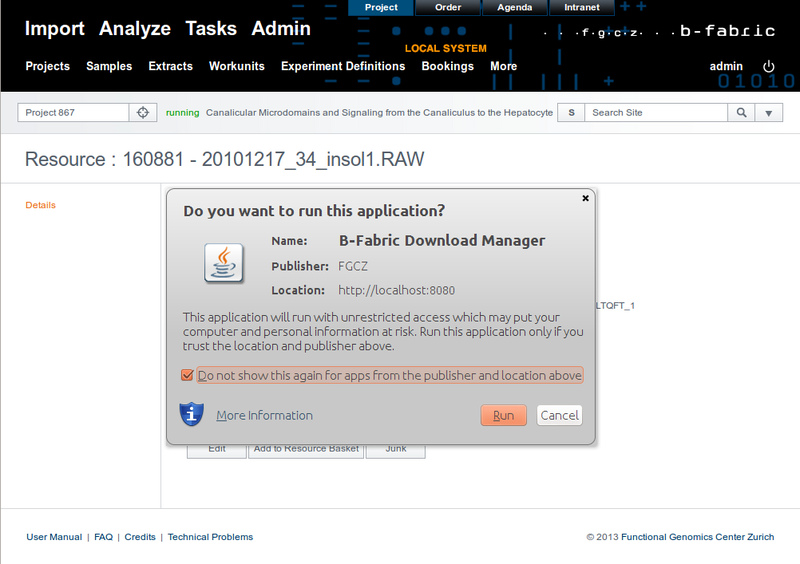 As a default setting, the B-Fabric Download Manager uses predefined B-Fabric-Downloads folder in the user's home directory for its downloads. This approach is useful to locate downloaded file. On the other hand, it might be problematic for insufficient free disk space and user flexibility. 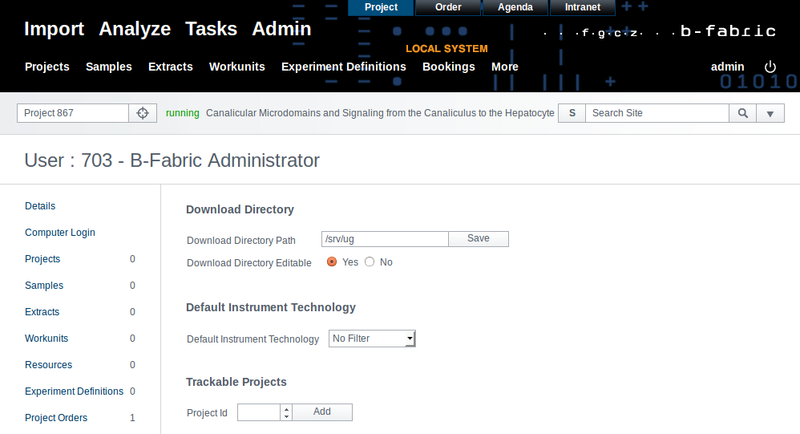 Therefore, B-Fabric allows users to configure their default download directory path and an option to choose the download directory right before a download starts. Go to your user settings in order to set these two configuration parameters. Download Directory Path: configures the default download directory path. 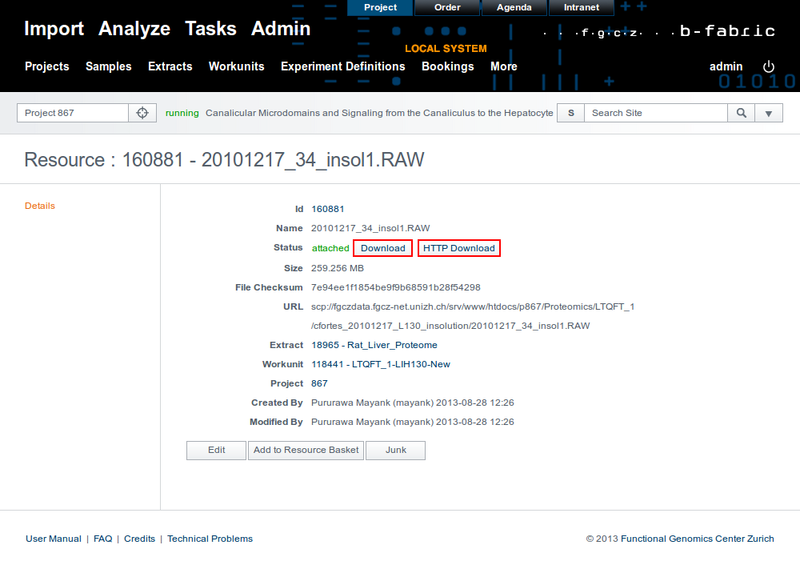 If it is set to null then it uses B-Fabric-Downloads folder under the user's home directory. 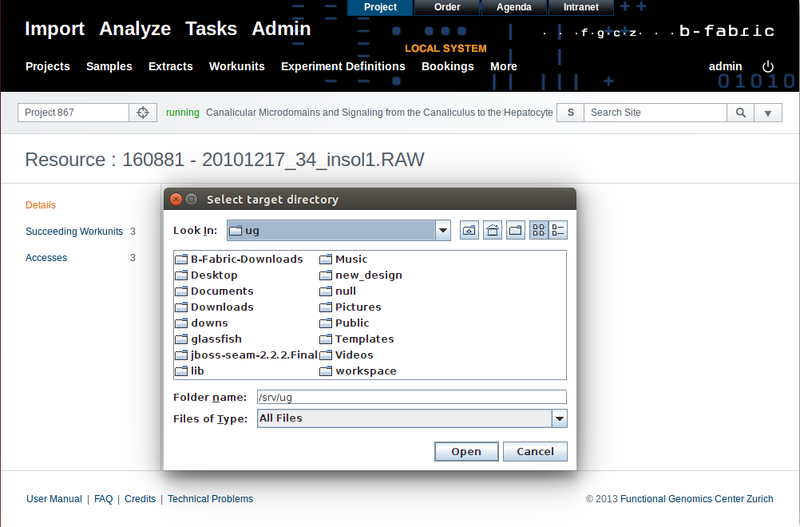 Download Directory Editable: configures whether the download directory is asked to the user in every download or not. If it is set to true, a new panel will be prompted to the user before a new download starts; if it is set to false, it will use default download directory path without asking the user again. When download directory is editable, then each download will pop-up a panel that asks for target directory of the download. all files that can be download with the DownloadManager of B-Fabric can be accessed with a command-line tool. The cookie can be fetched by login to the FGCZ Single-Sign-On page. The cookie is only valid for one project and expires in 24 hours. As the cookie is the key to your data, keep it as secret as you want your data. The page uses SSL which are signed by the FGCZ CA attached to this page. The URL to your data is not the one of the HTTP Download. HTTP Download has its own authentication. You can find the links in the jnlp-file you get by pressing the Download button in B-Fabric. Usually it is the URL of the HTTP Download, by adding /dm/ after the hostname. In the examples below, use your username and projectid. You will be asked for the password. See manual of curl for details. $ curl -b cookie "http://fgcz-gstore.uzh.ch/dm/p123/..."
Unfortunately it is not possible to get the cookie via wget. But the cookie from curl works with wget. $ wget --load-cookie cookie "http://fgcz-gstore.uzh.ch/dm/p123/..."
Created by uguerel. Last Modification: Friday March 24, 2017 18:00:40 CET by schmidt.